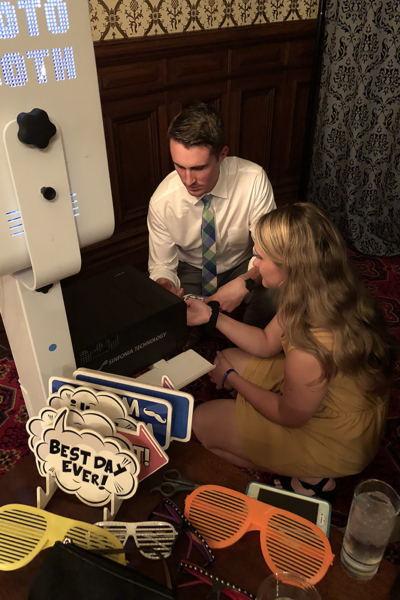 I was attending my college roommate’s wedding in Richmond, VA on June 9th, 2018, enjoying drinks with old friends and of course, eagerly awaiting taking some photos at the photo booth (not ours! it was the DJ’s). I walked over and noticed a very stressed out photo booth attendant frantically trying to fix the printer. “I’m sorry, the printer is broken, but you can still take photos and receive them digitally after the event”, the photo technician said, sheepishly. I knew that this was my moment to shine. I felt like a doctor coming to the rescue on an airplane. I had been training for this moment for years. I had often fantasized that my limited, hyper-specific skill set would one day put me in a position to save a party. I looked into the belly of a foreign printer I had never used before. The ribbon had torn in half, and I could see an off-color print seared onto the photo paper. “Scapple!”, I commanded jokingly to an interested observer. The interested on-looking scurried upstairs and ran back down with a pair of scissors. I cut off the psychedelic-colored failed photo print to reveal clean photo paper, and asked the photo booth technician which end of the ribbon was the “catch” feed. I train all my photo technicians extensively on re-loading paper and on how to prevent and fix ribbon tears. They go through extensive online training courses and always have an operations manager (usually me) on call to advise and send video links in the event of a malfunction. This attendant was under-trained and under-equipped. That’s why we have had 0 events where printers were not brought back to life (knock on wood!). Quality fade is often the result when clients hire photo booth services through their DJs, or fly-by-night cheap photo booth companies. They don’t care about the details. This is why we are not cheap. We LOVE what we do and we pour everything into making sure each one of our events are a success. Anyway, back to the story. I figured the empty roller was the CATCH feed and I rolled the broken ribbon a bunch of times onto the catch feed and the attendant stuck all the printer media back in, and we crossed our fingers. The printer sputtered, shot out some prints, and was revived from the dead. “THANK YOU SO MUCH!” the attendant said, with a big sigh of relief. She then proceeded to tell the story of the “photo booth guy” who saved the photo booth to the ENTIRE party, and photo booth service continued without incident. Everyone got prints. The groom, my college roommate, embraced me later that night and thanked me. For a brief moment, I felt like super man. Perhaps in the grand scheme of things, a broken printer isn’t a big deal. But to us, it’s ALWAYS a big deal. Even if it’s not our photo booth. This incident reinforced how incredibly proud I am of the service level we offer. We are obsessed with the details and have multiple people supervising every event, ensuring our clients’ event success. We often get asked why we are so expensive, and frankly, it’s because we’re damn good at what we do, and we value how much effort we put into every event. When you hire Maple Leaf, you are family, and you will be treated like family.